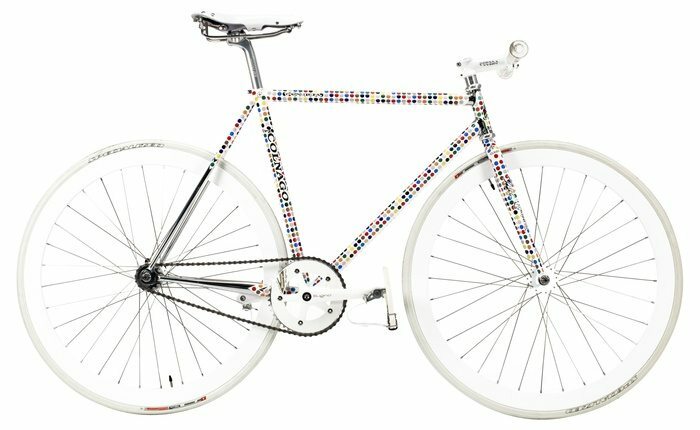 Um, yes, I have a totally Gucci bike. I admit it and I’m incredibly grateful for it. It even has full carbon wheels that I honestly feel make me faster just because they look so damn good. 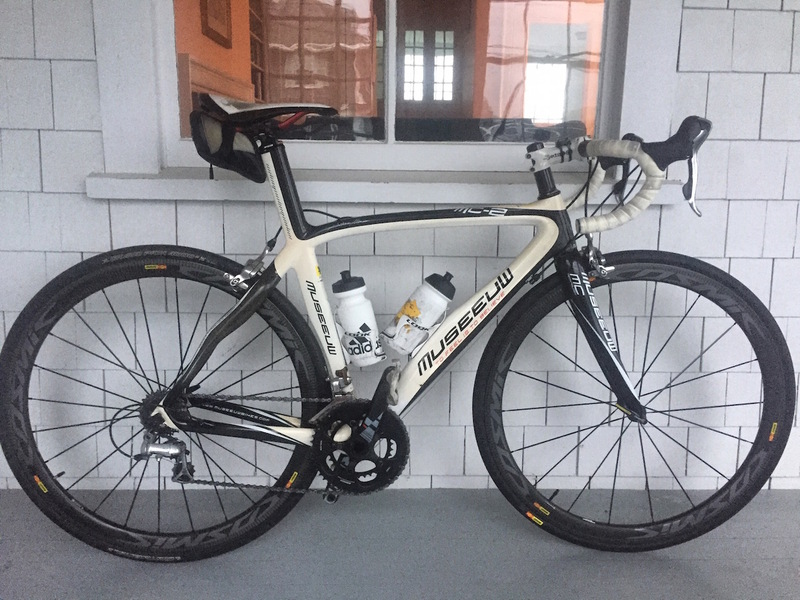 You can also see it has a fully integrated seat post that was cut especially for me on that magic day when I finally understood the essential power (and sheer necessity) of quality (and beauty) when it comes to doing the things we love. And it was custom-fitted for my unique/utterly average body type by a extremely talented bike fitter. It’s been part of me almost since the day I rode it out of the shop. And my feelings of love and connection with it have only intensified since I recently spent 10 days riding across France with some very special spandex clad people raising money for a very special cause. …the late Robin Wlliams’ bike collection came up for auction. And then I started surfing around through a vast array of bike history. And then I said to myself, “I’m a size 54.”” And then I thought back to all the amazing Robin Williams comedy that made me laugh so hard over the years. And then I thought about how he died and how prevalent and powerful depression is and how grateful I am to have the life that I have. 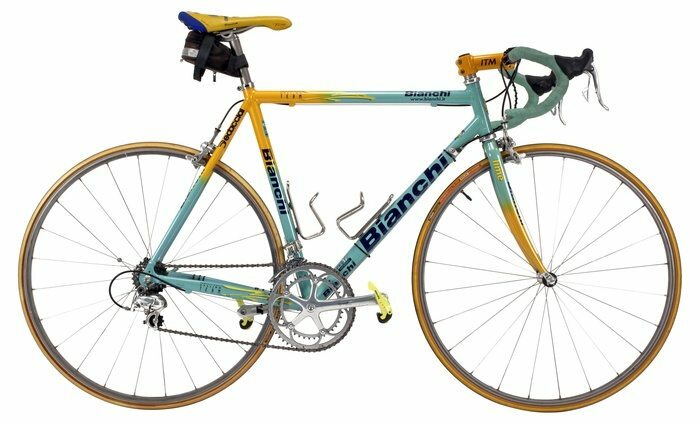 And then, in the every next beat, I started lusting after this exact replica of Marco Pantani’s 1998 Mega Pro XL Reparto Corse Team (Limited Edition), Bianchi. I want it! I want it! Gimme! Gimme! Gimme! Everything from the celeste paint on the last of the great steel frames, to the Campagnolo Record groupo, to the Campagnolo Electron wheels, and the pièce de résistance–the Marco Pantani “The Pirate” Selle Italia Flite saddle–is simply sublime. And the fact that this was the bike that was ridden at the height of the doping era by Pantani (who I have such a soft spot in my heart for) makes it even more sublime. 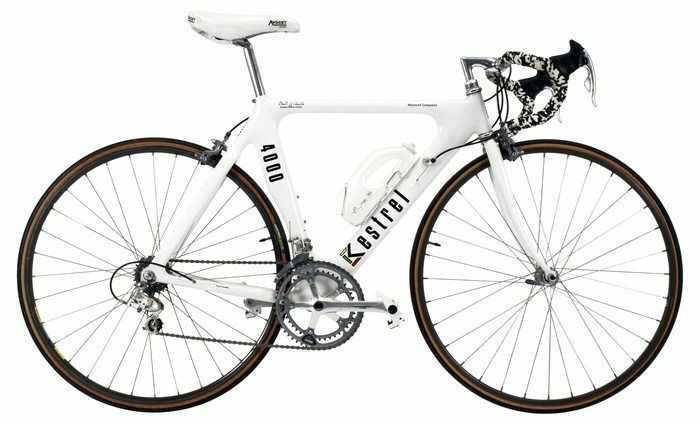 And this bright-white Kestrel that was built in 1985 and is described as “Designed by Brent Trimble, the Kestrel “4000” is the first all-carbon composite bike frame. Extremely rare, it truly is a piece of road cycling frame design history,” only because they strike me as very, very Swizzle. So what do you think? Should I make a bid? All three of these bikes already have some of the largest bids of the entire auction. Next articleCan someone show me how to get back to the ocean, please? Bill, My mother always told me that if you don’t get what you want it because you didn’t want it badly enough or you haggled over the price. Good advice. I may not want more than one bike badly enough! And I’m kinda glad to know that. Oh go ahead. But the real fun is building up a bike like a fixie/single speed of really cool parts that you have lying around and your son saying, cool dad, I love that bike! Yeah, you’re probably right. But the funny thing is I don’t know if I’d actually ride another bike. Could be like cheating, maybe.